(Clearwisdom.net) On November 24 and 25, 2010, schoolmasters from one thousand top schools in India attended their annual conference in Bombay. The organizers invited the Divine Land Marching Band to perform at the conference. The audience responded with warm enthusiasm to the band's magnificent performance. 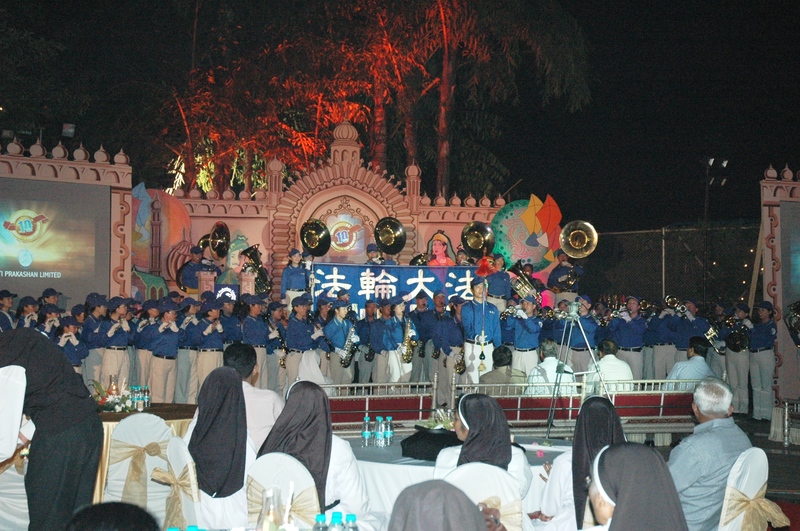 On November 24 and 25 2010, the Divine Land Marching Band was invited to perform at the Indian National Top 1000 Schoolmasters Conference. The Divine Land Marching Band, composed of all Falun Gong practitioners, played at the conference's evening party and several private schools. The Divine Land Marching Band's performance received a warm response from the audience. The national conference was held in a beautiful lakeside hotel. At noon on November 24, the Divine Land Marching Band stepped up onto the stage in their bright blue and white uniforms. First, an Indian Falun Dafa practitioner introduced Falun Dafa, told how it has been embraced in over one hundred countries, and also exposed the brutal persecution going on in China. 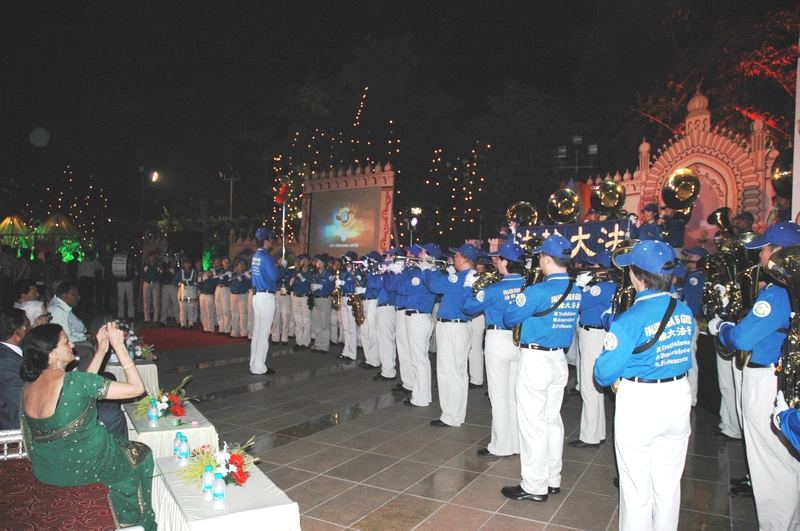 The band's performance at the evening party brought a sense of serenity and peace. The band performed five melodies, including "Falun Dafa Is Good," "Delivering Precious Gifts," and "Fa Rectifies the Universe." The attendees applauded them warmly. The schoolmasters raised their thumbs to praise the performance, nodded their heads, and said, "Thank you, very good!" Appreciation and excitement were evident from their expressions. Near evening, the band marched in the streets and entered a half-moon shaped garden. When the music started, many people gathered around to listen. Immersed in the serene music, their happy faces glowed. Just then, a rainbow appeared in the sky to the left above the trees and buildings. A supermarket manager heard the music and instructed his workers to take soft drinks to the band members. He also presented the band a bouquet of flowers and had his photo taken with them. On the morning of November 25, the band was invited to perform at three private schools and to demonstrate the Falun Gong exercises. 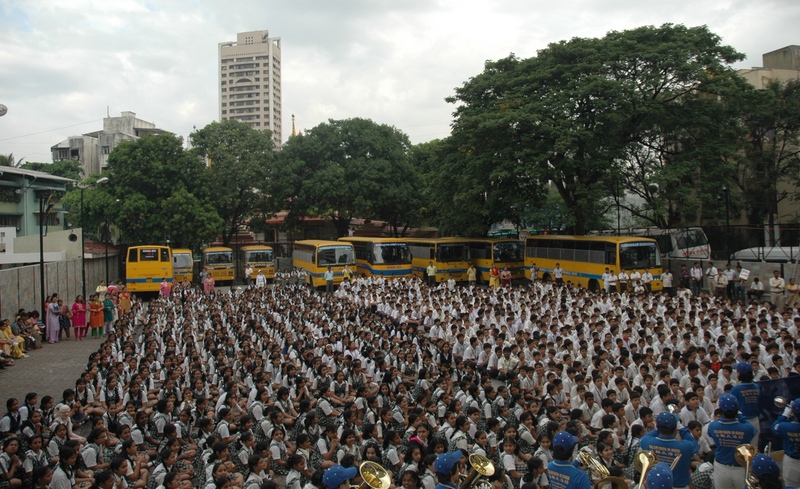 The teachers and students were very excited to hear such a large scale band and the beautiful music. They cheered loudly and applauded enthusiastically. When they heard the familiar melodies "Ode to Joy" and "Jingle Bells," they clapped their hands along with the rhythm. The teachers and students listened to the introduction to Falun Dafa and heard about the persecution going on in China. They chanted "Falun Dafa is good" along with the practitioners. In the evening, local officials and the schoolmasters had another evening party and invited the Divine Land Marching Band to perform again. When the band got on stage, many reporters arrived and shot a lot of photos. When the performance started, the divine music praising the Buddha filled the space, and the attendees repeatedly said, "Thank you! This is very good! Very good!"